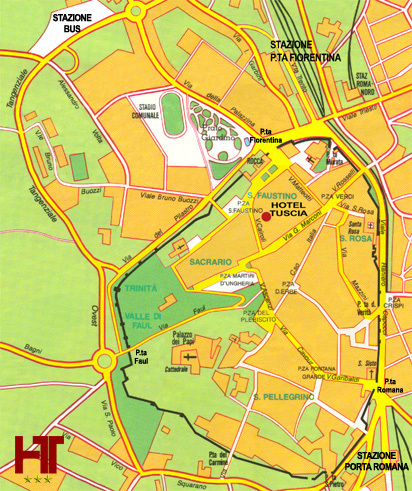 "Porta fiorentina" railway station and nearest bus stop are about 500 mt from the hotel. There are many parkings in the neighbours. Highway A1 (Roma-Firenze) exit ORTE, then Orte-Viterbo freeway. Exit VITERBO NORD and follow the road signs for "CENTRO". When you will see the city walls cross them through "Porta Fiorentina" gate, then follow obliged directions. AS an alternative from ROMA, or driving from SIENA, by national road S.S.2 CASSIA across the pleasant latian or tuscan countryside. 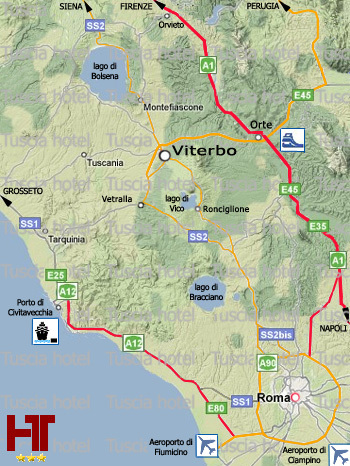 From all directions stop at ORTE railway station and switch to local train to reach Viterbo-PORTA FIORENTINA station. From "ROMA OSTIENSE, ROMA TRASTEVERE, ROMA S.PIETRO" railway stations take the local train to Viterbo-PORTA FIORENTINA or Viterbo-PORTA ROMANA (Viterbo has two railway stations). There are trains every hour departing from Rome to Viterbo and the trip takes about 1h.50 min. Get the trains to ROMA TRASTEVERE station (leaving every 15min., the trip takes 26 min.). Get off at Roma Trastevere and wait for the connection wich will take you to Viterbo. (see item by train). Take a shuttle bus for "ROMA TERMINI" railway central station, then take a train to ORTE and switch to local train to reach Viterbo-PORTA FIORENTINA station.